our special 10th anniversary t-shirt shop! 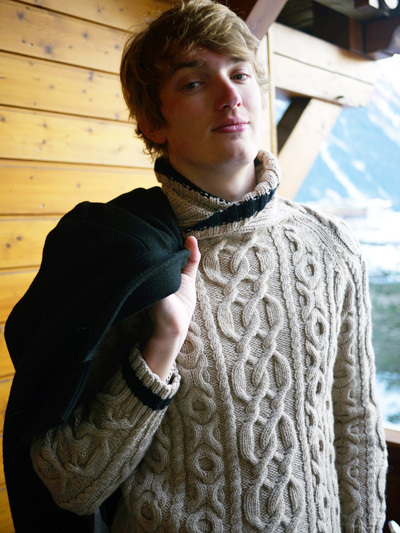 Argentière, a thick, close-fitting sweater with a contrast stripe detail at the cuffs and surplice collar, sports a cable pattern inspired by the first tracings of skis on an early-morning Alpine slope. 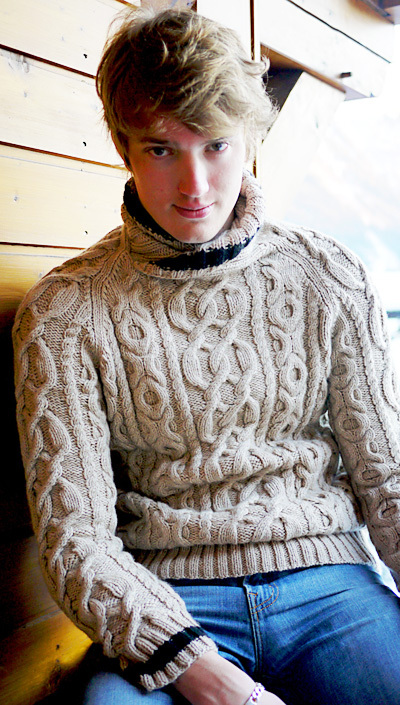 Knitted in whatever soft yarn you choose, it will make a winter staple to keep him cozy on the chilliest of days. Note: Yarn is held double throughout. Note: If preferred, straight needles may be used for body and sleeves; a circular needle is only necessary for the collar. C3R: Sl next st to cn and hold at back, k2; k1 from cn. C5F: Sl 3 sts to cn and hold at front, k2; k3 from cn. C5B: Sl 2 sts to cn and hold at back, k3; k2 from cn. C6B: Sl 3 sts to cn and hold at back, k3; k3 from cn. C6F: Sl 3 sts to cn and hold at front, k3; k3 from cn. C8B: Sl 4 sts to cn and hold at back, k4; k4 from cn. Keep cable pattern intact whenever possible. When working a cable is no longer possible, simply continue to knit the knit sts and purl the purl sts. All sts are slipped p-wise with yarn in back on RS rows and p-wise with yarn in front on WS rows. Row 1 [RS]: P2, (k12, p2, sl1, k2, p2) 2[2, 2, 3, 3] times, k4, p4, k8, p4, k4, (p2, sl1, k2, p2, k12) 2[2, 2, 3, 3] times, p2. Row 2 [WS]: K2, (p12, k2, p2, sl1, k2) 2[2, 2, 3, 3] times, p4, k4, p8, k4, p4, (k2, p2, sl1, k2, p12) 2[2, 2, 3, 3] times, k2. Row 3: P2, (k12, p2, C3R, p2) 2[2, 2, 3, 3] times, k4, p4, C8B, p4, k4, (p2, C3R, p2, k12) 2[2, 2, 3, 3] times, p2. Row 4: K2, (p12, k2, p3, k2) 2[2, 2, 3, 3] times, p4, k4, p8, k4, p4, (k2, p3, k2, p12) 2[2, 2, 3, 3] times, k2. Row 5: P2, (C6B, C6F, p2, sl1, k2, p2) 2[2, 2, 3, 3] times, (C5F, p2, C5B) twice, (p2, sl1, k2, p2, C6B, C6F) 2[2, 2, 3, 3] times, p2. Row 6: K2, (p12, k2, p2, sl1, k2) 2[2, 2, 3, 3] times, k1, p4, (k2, p4) 3 times, k1, (k2, p2, sl1, k2, p12) 2[2, 2, 3, 3] times, k2. Row 7: P2, (k12, p2, C3R, p2) 2[2, 2, 3, 3] times, (p1, C5F, C5B, p1) twice, (p2, C3R, p2, k12) 2[2, 2, 3, 3] times, p2. Row 8: K2, (p12, k2, p3, k2) 2[2, 2, 3, 3] times, (k2, p8, k2) twice, (k2, p3, k2, p12) 2[2, 2, 3, 3] times, k2. Row 9: P2, (k12, p2, sl1, k2, p2) 2[2, 2, 3, 3] times, (p2, C8B, p2) twice, (p2, sl1, k2, p2, k12) 2[2, 2, 3, 3] times, p2. Row 10: K2, (p12, k2, p2, sl1, k2) 2[2, 2, 3, 3] times, (k2, p8, k2) twice, (k2, p2, sl1, k2, p12) 2[2, 2, 3, 3] times, k2. Row 11: P2, (C6B, C6F, p2, C3R, p2) 2[2, 2, 3, 3] times, (p2, k8, p2) twice, (p2, C3R, p2, C6B, C6F) twice, p2. Row 12: K2, (p12, k2, p3, k2) 2[2, 2, 3, 3] times, (k2, p8, k2) twice, (k2, p3, k2, p12) 2[2, 2, 3, 3] times, k2. Row 13: P2, (k12, p2, sl1, k2, p2) 2[2, 2, 3, 3] times, (p2, C8B, p2) twice, (p2, sl1, k2, p2, k12) 2[2, 2, 3, 3] times, p2. Row 14: K2, (p12, k2, p2, sl1, k2) 2[2, 2, 3, 3] times, (k2, p8, k2) twice, (k2, p2, sl1, k2, p12) 2[2, 2, 3, 3] times, k2. Row 15: P2, (k12, p2, C3R, p2) 2[2, 2, 3, 3] times, (p1, C5B, C5F, p1) twice, (p2, C3R, p2, k12) 2[2, 2, 3, 3] times, p2. Row 16: K2, (p12, k2, p3, k2) 2[2, 2, 3, 3] times, k1, p4, (k2, p4) 3 times, k1, (k2, p3, k2, p12) 2[2, 2, 3, 3] times, k2. Row 17: P2, (C6F, C6B, p2, sl1, k2, p2) 2[2, 2, 3, 3] times, (C5B, p2, C5F) twice, (p2, sl1, k2, p2, C6F, C6B) 2[2, 2, 3, 3] times, p2. Row 18: K2, (p12, k2, p2, sl1, k2) 2[2, 2, 3, 3] times, p4, k4, p8, k4, p4, (k2, p2, sl1, k2, p12) 2[2, 2, 3, 3] times, k2. Row 19: P2, (k12, p2, C3R, p2) 2[2, 2, 3, 3] times, k4, p4, C8B, p4, k4, (p2, C3R, p2, k12) 2[2, 2, 3, 3] times, p2. Row 20: K2, (p12, k2, p3, k2) 2[2, 2, 3, 3] times, p4, k4, p8, k4, p4, (k2, p3, k2, p12) 2[2, 2, 3, 3] times, k2. Row 21: P2, (k12, p2, sl1, k2, p2) 2[2, 2, 3, 3] times, k4, p4, k8, p4, k4, (p2, sl1, k2, p2, k12) 2[2, 2, 3, 3] times, p2. Row 22: K2, (p12, k2, p2, sl1, k2) 2[2, 2, 3, 3] times, p4, k4, p8, k4, p4, (k2, p2, sl1, k2, p12) 2[2, 2, 3, 3] times, k2. Row 23: P2, (C6F, C6B, p2, C3R, p2) 2[2, 2, 3, 3] times, k4, p4, k8, p4, k4, (p2, C3R, p2, C6F, C6B) 2[2, 2, 3, 3] times, p2. Row 24 [WS]: K2, (p12, k2, p3, k2) 2[2, 2, 3, 3] times, p4, k4, p8, k4, p4, (k2, p3, k2, p12) 2[2, 2, 3, 3] times, k2. Rep Rows 1-24 for pattern. The chart for this pattern is very large and fits on a letter-sized page. With US #7/4.5mm needles and MC, CO 114[124, 136, 150, 156] sts. Row 1 [RS]: (K2, p2) to last 2[0, 0, 2, 0] sts, k2[0, 0, 2, 0]. Row 2 [WS]: P2[0, 0, 2, 0], (k2, p2) to end. Rep last 2 rows nine times more (for 20 rows total of 2x2 rib). Change to US #9/5.5mm needles. Next row [RS]: K5[10, 16, 4, 7], work Row 1 of Cable-and-Rib Patt, working repeats in red box as indicated on chart, k5[10, 16, 4, 7]. Next row [WS]: P5[10, 16, 4, 7], work Row 2 of Cable-and-Rib Patt, p5[10, 16, 4, 7]. Cont in est patt, working St st either side of chart patt, until work measures 18[18, 18, 19, 19.5] inches from cast on, ending after a WS row. Cont in patt, BO 12 sts at beg of next 2 rows. Decrease row [RS]: K1, ssk, work in patt to last 3 sts, k2tog, k1. Decrease row [WS]: P1, p2tog, work in patt to last 3 sts, ssp, p1. BO rem 42[46, 50, 48, 48] sts. Work as for BACK until piece measures 25.5[25.5, 25.5, 27, 28] inches from cast on, ending after a WS row. Using removable st markers, mark center 42[46, 50, 48, 48] sts. Next row [RS]: Patt to first marker just placed (including any raglan decreases), place all sts just worked on holder for left neck. Bind off center 42[46, 50, 48, 48] sts between markers. Patt to end (including any raglan decreases). Right neck will be worked on these sts only. Next row [WS]: Patt to end, including any raglan shaping at armhole edge. 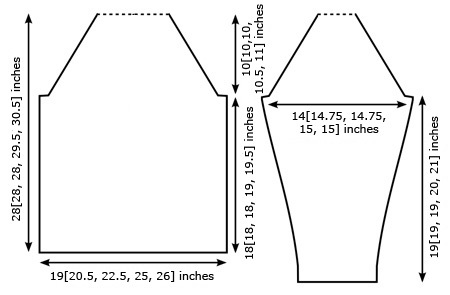 Cont in patt, shaping raglan as for Back, until piece measures 5[5, 5, 3, 3] rows shorter than Back and 2 sts rem. Next decrease row [RS]: K2tog. Work in St st for 3[3, 3, 1, 1] row(s). With WS facing, attach yarn to Left neck at neck edge. Next row [WS]: Patt to end of held sts, including any raglan shaping at armhole edge. Next decrease row [RS]: Ssk. With US #7/4.5mm needles and MC, CO 60 sts. Rib Row: (K2, p2) across. Rep Rib Row three times more. Change to CC and rep Rib Row six times more. Change to MC and rep Rib Row ten times more. 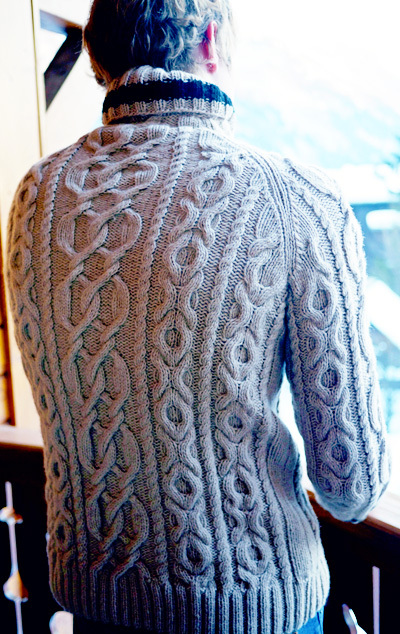 Next row [RS]: K11, starting on stitch 15, work Row 1 of Cable and Rib Pattern over next 38 sts, ending on stitch 52, k11. Next row [WS]: P11, starting on stitch 52, work Row 2 of Sleeve Chart over next 38 sts, ending on stitch 15, p11. Cont in St st and chart as est for 8[6, 6, 6, 6] rows more. Increase Row [RS]: K1, M1, patt to last st, M1, k1. Cont even in patt until work meas 19[19, 19, 20, 21] inches from cast on, ending after a WS row. 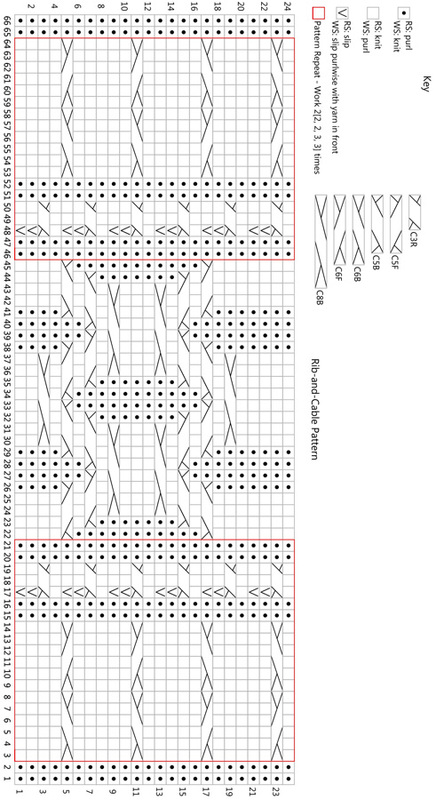 Weave in ends and block to measurements shown in schematic. 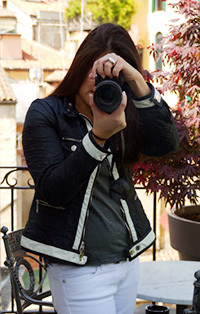 Join raglan seams, sleeve seams, and side seams. Rib Row: (K2, p2) to end. Rep Rib Row four times more. Rep Increase Row every 4th row six times more, then work 3 rows even in patt. 33 rows worked from neck. Change to CC and rep Increase Row once more, then every 4th row once, then work 1 row even in patt. Change to MC and work 2 rows even in patt, then work Increase Row once more. BO loosely in rib, using a larger needle if necessary. Align right neck edge of collar along bound off edge of front neck sts. Secure with pins then seam together. Align left neck edge of collar along bound off edge of front neck sts, over the collar edge already sewn in place. Secure with pins then seam together.